This week marks the twentieth anniversary of the Bosnian War. Its a time for remembrance, of the circumstances that created it, the people who planned it, the perpetrators and the victims. Most of the focus will be on Sarajevo later this week and next week wh ere some of the journalists who covered the war are having a re-union at the Holiday Inn. But we’d do well to remember the town where ethnic cleansing in Bosnia began, 1-4 April 1992, the northeastern town of Bijeljina (Ron Haviv’s famous photo of Arkan’s forces in Bijeljina is left). I’ve written an opinion piece on the twentieth anniversary which is available at the Oxford University Press blog. I’ve also created some material related to Bijeljina on the Bosnia Remade website. 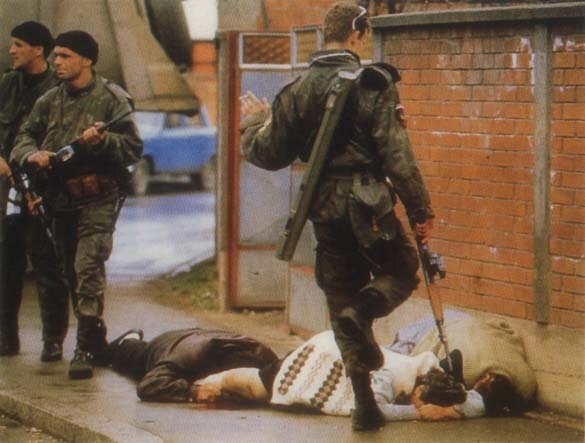 After destroying Bijeljina’s multiethnic life, Arkan and the JNA moved south and attacked Zvornik, terrorizing it and seizing it on the 10 April 1992. SDS activists set up street barricades around Sarajevo on 5 April 1992. This entry was posted in Bosnian war, ethnic cleansing, Geography, Geopolitics, Radovan Karadzic, war crimes and tagged 20 year anniversary, Bijeljina, Bosnian war, ethnic cleansing. Bookmark the permalink.